Dan Aykroyd poses for a photo with Lake Tahoe residents Duane Suttor and Meghan Burk at the Crystal Head Vodka event in October 2017 at the Hard Rock Hotel & Casino. The several hundred people who met Dan Aykroyd in October 2017 also learned what’s in his head. 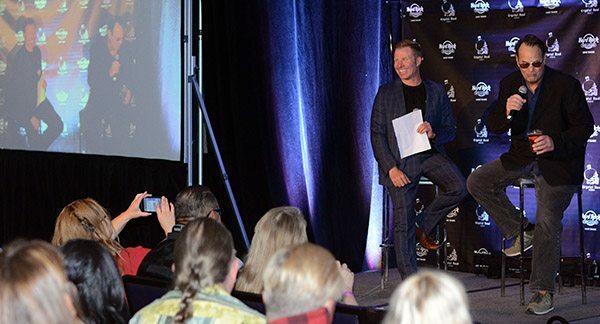 At Lake Tahoe’s Hard Rock Hotel & Casino to promote his Crystal Head Vodka, the movie star and “Saturday Night Live” comedian star also championed civility and respect while expressing empathy for working musicians. Stacie Frakes and her husband traveled from Battle Mountain, Nevada, for the chance to meet Aykroyd. “He’s really mellow,” she said. 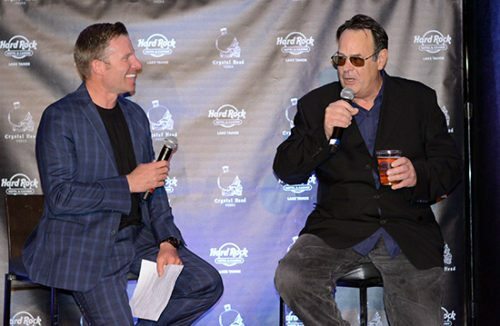 Dreu Murin interviews Dan Aykroyd during the Crystal Head Vodka tasting event at the Hard Rock Hotel & Casino. Perhaps it was the vodka or even the IPA he sipped during the Q&A, but Aykroyd appeared genuinely congenial and down to earth. Fame hasn’t gone to his head, just the libation, which he pitched politely but with a genuine conviction. Fresno resident Jose Cabrera bought two bottles, not necessarily to drink but as an investment in collector’s items. “I am a whiskey guy, not a vodka guy, but I do like the way it tastes,” he said. 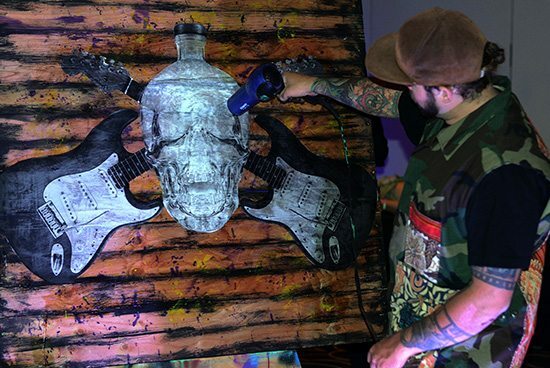 The McFarlands and Cyndy Houck of South Lake Tahoe both purchased Crystal Head-inspired artwork painted during the event by Lake Tahoe’s Will Eichelberger. Each painting brought $1,300 in an auction that benefits Pinktober, a breast cancer fundraiser. People lined up to shake hands and have their photo taken with Aykroyd before entering the cocktail room. On the other end of the casino, in the Vinyl showroom, there was a Halloween party. Aykroyd doesn’t like to fly. He prefers to drive backroads on his trips. However, he had to fly today in order to make an appearance in Minnesota with The Blues Brothers. Jim Belushi has replaced his brother John – Joliet Jake – as Elwood Blues’ onstage partner. Aykroyd, 65, said he will never perform in a chair but will keep dancing and singing until his knees give out. Someone shouted that she wanted to see a new movie starring Dan Aykroyd. But we might not see one for a while. Related story: Tahoe Onstage Q&A with Dan Aykroyd. 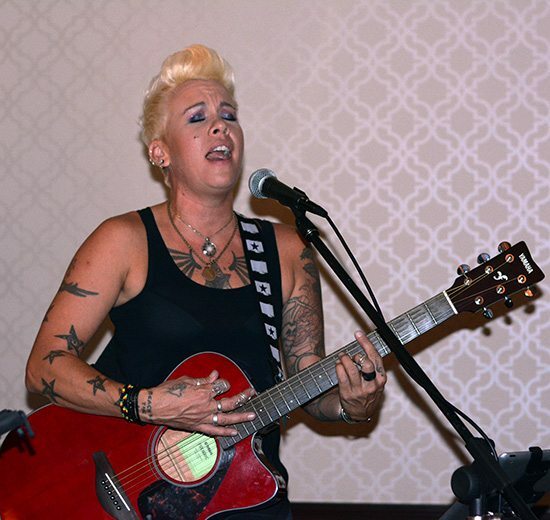 South Shore’s Athena McIntyre sings during the tasting party. Jaclyn Baird, left, and Katie Cox serve Crystal Head Vodka Orange Whips. Will Eichelberger creates two pieces of art to be auctioned to fight breast cancer. 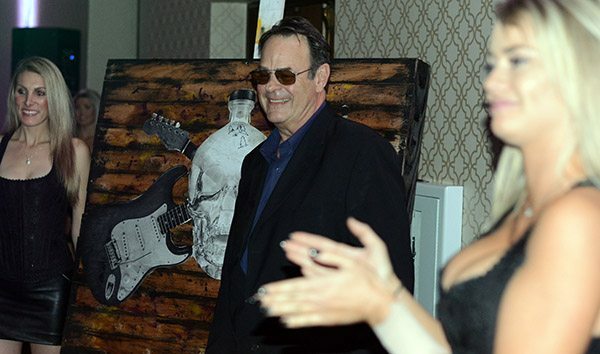 Dan Aykroyd is flanked by Jaclyn Baird, left, and Katie Cox and the two paintings by Tahoe artist Will Eichelberger, each auctioned for $1,300 to benefit Pinktober, at the Hard Rock Hotel & Casino. Dreu Murin and Dan Aykroyd are in synch during the question-and-answer session at the Hard Rock.